Ependyma is the thin epithelial lining of the ventricular system of the brain and the central canal of the spinal cord, made up of ependymal cells. Ependyma is one of the four types of neuroglia in the central nervous system (CNS). It is involved in the production of cerebrospinal fluid (CSF), and is shown to serve as a reservoir for neuroregeneration. The ependyma is made up of ependymal cells called ependymocytes, a type of glial cell. 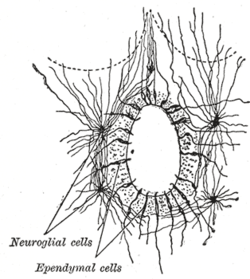 These cells line the CSF-filled ventricles in the brain and the central canal of the spinal cord. These are nervous tissue cells with a ciliated simple columnar form much like that of some mucosal epithelial cells. The basal membranes of these cells are characterized by tentacle-like extensions that attach to astrocytes. 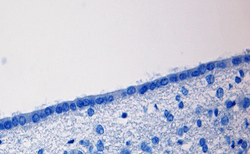 Lining the CSF-filled ventricles, the ependymal cells play an important role in the production and regulation of CSF. Their apical surfaces are covered in a layer of cilia, which circulate CSF around the CNS. Their apical surfaces are also covered with microvilli, which absorb CSF. Within the ventricles of the brain, a population of modified ependymal cells and capillaries together form a system called the choroid plexus, which produces the CSF. Modified tight junctions between ependymal cells control fluid release across the epithelium. This release allows free exchange between CSF and nervous tissue of brain and spinal cord, which is why sampling of CSF (e.g. through a "spinal tap") provides a window to the CNS. Jonas Frisén and his colleagues at the Karolinska Institute in Stockholm provided evidence that ependymal cells act as reservoir cells in the forebrain, which can be activated after stroke and as in vivo and in vitro stem cells in the spinal cord. However, these cells did not self-renew and were subsequently depleted as they generated new neurons, thus failing to satisfy the requirement for stem cells. One study observed that ependymal cells from the lining of the lateral ventricle might be a source for cells which can be transplanted into the cochlea to reverse hearing loss. Ependymoma is a tumor of the ependymal cells most commonly found in the fourth ventricle. ↑ "ependyma". The Free Dictionary. ↑ Johansson CB, Momma S, Clarke DL, Risling M, Lendahl U, Frisen J (1999). "Identification of a neural stem cell in the adult mammalian central nervous system". Cell. 96 (1): 25–34. doi:10.1016/S0092-8674(00)80956-3. PMID 9989494. ↑ Carlén M, Meletis K, Göritz C, Darsalia V, Evergren E, Tanigaki K, Amendola M, Barnabé-Heider F, Yeung MS, Naldini L, Honjo T, Kokaia Z, Shupliakov O, Cassidy RM, Lindvall O, Frisén J (2009). "Forebrain ependymal cells are Notch-dependent and generate neuroblasts and astrocytes after stroke.". Nature Neuroscience. 12 (3): 259–267. doi:10.1038/nn.2268. PMID 19234458. ↑ "Brain cell hope for hearing loss". BBC News. 2008-12-09. Retrieved 2008-12-09.